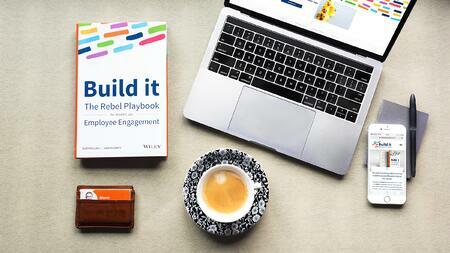 It’s nearing the end of February, and close followers of Reward Gateway likely know what this means: “Build it: The Rebel Playbook to World-Class Employee Engagement” hits shelves in just over a week. To add to the buzz of the rebelution, we sat down with the authors, Glenn Elliott and Debra Corey, and asked a few questions about their past experiences, dealing with writer’s block, and what it means to be a rebel in the workplace today. Haven’t pre-ordered your copy just yet? The book is available on Kindle now, and starts shipping in just a week! Even better? Those that pre-order get the first two chapters as a free download. 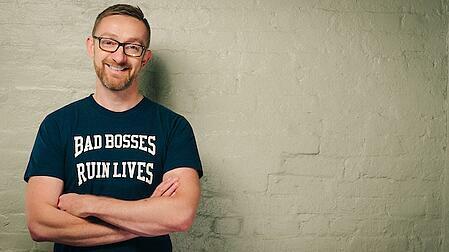 What inspires you every day to make the world a better place to work? Glenn: I meet so many people who are in poor work environments – they could offer so much more to their employer and they could be so much happier, but the very way we run our organizations disengages them and stifles their creativity and innovation. That's what drives me to write – the belief that work could be so much better, better for the employees and the companies. I love it when I get a note from someone far away who has read something I've written online and it has inspired or helped them make their part of the world a better place to work. Debra: Inspiration comes to me in two ways. The first is through the knowledge that what I’m writing is going to make a difference, that my words and ideas will inspire my fellow HR and business colleagues to begin or continue their journey as an engagement rebel. The second is down to passion, which drives me to see the world through an engagement lens, taking thoughts, ideas and inspiration from all around me, translating them into words to again help us all grow and learn together to achieve our engagement missions. Glenn: I don't really have writer’s block, I have the opposite. I'm not sure if it has a name, but I can have a ton of ideas about a subject and I have to get them all down before figuring out which ones are best and which ones work to explain the points. It makes for a lot of writing, a lot of editing and a lot of unused content. Debra: I have to confess that I do have writer’s block from time to time. When this happens, the first thing I do is try to understand why. Is it because I need to do a bit more thinking or research on the topic? Is it because I’m just not in the right frame of mind? The solution for both is often as simple as taking a walk outside, freeing my mind to pull together my thoughts and to get in the writing mindset. By the way, this doesn’t just work with writing, but with other challenges I face both at work and at home. Tell us a short, work-related horror story. Glenn: My last corporate job was so boring and such a poor fit for me that I once woke up asleep at my desk. When I turned to my left I found that my boss was also asleep. Debra: While doing a presentation to a group of employees to introduce a new benefit program, an employee in the back row stood up and threatened to throw a chair at me. I later found out that his reaction had nothing to do with me and the new employee benefit, but his overall feelings about the company. If that doesn’t show the links between the engagement elements, I don’t know what does. By the way, luckily he didn’t throw the chair at me as his buddies told him to sit down and shut up. Since the book talks about how to be a rebel, can you share which is the most rebellious chapter? Glenn: I think it might be the Leadership chapter - that is definitely one of my favorites. The world is really changing for leaders. Years ago you got promoted and that gave you status and a corner office and people did what you said. Now you need to inspire, lead, motivate them and create the environment where people can do their best work. There is so much more transparency and visibility in work now that is new. Glassdoor and other tools have really given people a voice and leaders really need to add value or they'll be exposed. One of our early reviewers, a company director who had recently taken on a bigger new leadership role said the Leadership chapter made him feel "a bit sick" when he realized how high the bar was that he needed to live up to. I hope it's a really inspiring and motivating chapter for leaders. Debra: I think the Job Design chapter is one of our most rebellious chapters. The first reason is that many in HR don’t even consider or address job design as an engagement lever. They ignore it or keep designing jobs the way they have always been done in the past. In the book we challenge this, saying that in the same way that work has fundamentally changed, so too should the way we design our jobs. One of my favorite rebellious quotes from the book is from this chapter, which says that “if we want engagement in our organizations, we need to stop creating disengaging jobs.” So true! Were there any topics you weren't sure on including? For example, did you almost cut leadership and then decided to keep it? If so, why did it survive? Glenn: There weren't any topics that we thought we should cut but there was one that we added relatively late and that is Workspace. 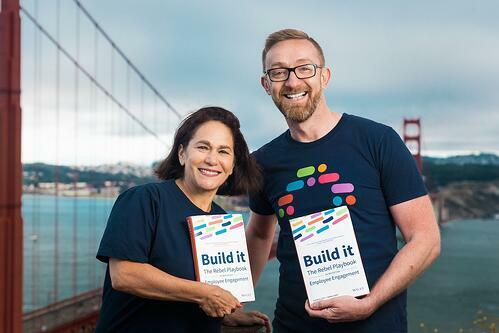 The book's structure follows a model we've developed over the last 10 years called the Engagement Bridge™. The Bridge™ itself was first presented about three years ago and in the first iteration, it did not include Workspace. 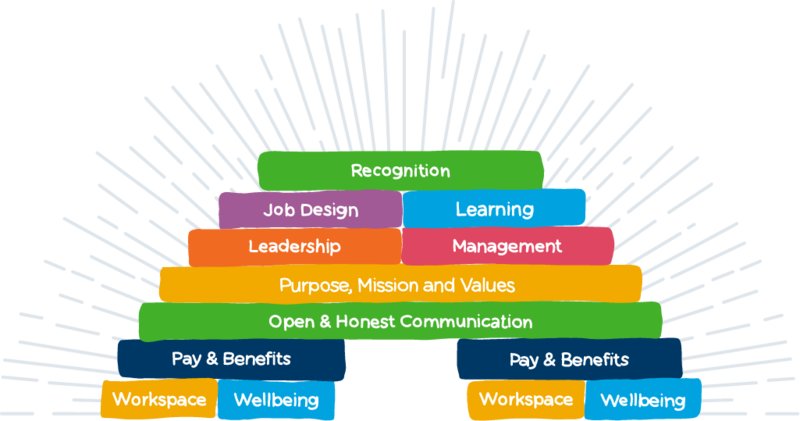 It took me a little longer to understand the role that Workspace has in employee engagement - originally I thought that fancy offices didn't have much of a serious role to play. The lightbulb moment came when I stopped thinking of Workspace as fancy decoration and started seeing it as the structure and tools that create the employee's experience. Workspace can either enhance and enable, or it can frustrate and demotivate, and I started seeing a lot more when I realized that. So Workspace was the topic that came last to us, but I'm really glad it came! Debra: There was a lot of material within each chapter that didn’t make it to the book. Part of the reason was because we felt it wasn’t rebellious enough, challenging ourselves by saying that if we’d heard it before it shouldn’t be in the book. The other reason is that we wanted to have an equal balance between strategy and practice, and so if the balance was off, it wasn’t included in the book. The good news is that we saved all of this valuable material, and will share it in the future on the book’s website or in personal blogs. In the next five years, which aspect of the Bridge do you expect to change the most and why? Glenn: I think most of the 10 elements of the Engagement Bridge™ are actually pretty stable - we've known what we need to do for years, many companies just aren't doing it. I think maybe the piece that has changed most and is continuing to change is Leadership and following from that, Management. In developed economies people have so much more choice now of where to work - we've still got almost full employment in the UK and USA and the demands that this plus the different attitudes of our younger staff are really ramping up the demands on leadership. It was one of the most exciting chapters of the book to write. Debra: I believe, well hope, that all areas of the Bridge™ will change in some way, no matter how small, over the next five years. This will happen because we have more rebels pushing and challenging the status quo, and because the world of work is constantly changing and thus our approach to engagement must change to keep up.